I recently purchased the Samsung HW-K450 to replace my aging surround sound and to compliment my new TV and entertainment center. Depending on your needs, a soundbar won’t replace a full surround sound system, but this unit does a good job filling my living room with sound and even bass. 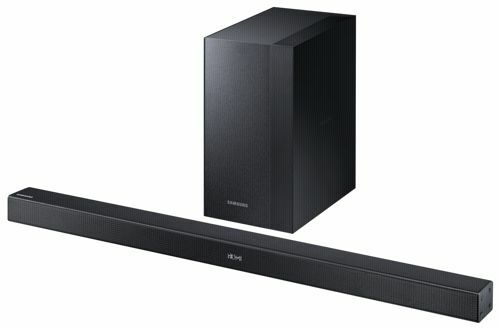 If you’re on the market for a soundbar and subwoofer combo, the $200 Samsung HW-K450 is a good choice. Setup was fairly simple. The remote comes with a battery that’s in a separate bag, so remember to find it before throwing away the packaging. I used the included optical cable to connect it to my Vizio TV. The Samsung HW-K450 paired with its sub as soon as both were powered on. The remote is fairly simple, but it does give you Sound Mix Options, Surround Options, and settings to tweak the treble, bass, and even the subwoofer levels. There’s also a Samsung Audio Remote App that you can download onto your smartphone. After tweaking the sound settings, I was very pleased with the depth and loudness of the Samsung HW-K450 system. I was pleased with the bass levels after turning up the bass and subwoofer levels. Voices were clear while watching shows and I didn’t notice any lip sync issues. While I’ve only had the Samsung HW-K450 for a few days, I don’t really have any dealbreakers or negatives. Since I came from having a true surround sound with an amplifier, the only con to the Samsung HW-K450 is the lack of rear surround sound speakers. The plus side is that Samsung offers a set of wireless surround speakers, the Samsung SWA-8000S .